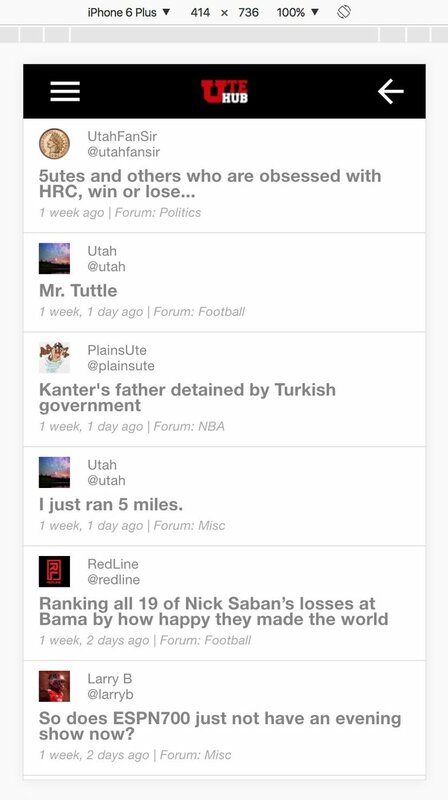 My current bbPress deployment is on the bbPress showcase here: https://bbpress.org/about/examples/ Ute Hub, the 2nd on the favorites list. My users have asked many times for a mobile version of the site. I’ve done two mobile apps, one an implementation of a straight WordPress blog. My current project is to build a bbPress app for iOS and Android. I’ve put a lot of work into it already and it’s shaping up nicely. I’m using two API’s discussed here: https://bbpress.org/forums/topic/is-there-an-api-for-bbpress/ for my data, and have modified one to my needs. I currently have a working app which reads the 10 latest posts straight from the site (pictured below). Tapping on the item loads the full topic. Next on the list is to get comments on posts, list of forums. Then perhaps release a read-only version for my users. Then I will work on authentication and allowing users to login and post from their mobile devices. Here’s a video of my current progress. I’m following along from the sidelines on the bbPress API, once we ship bbPress 2.6 then I hope to spend some time helping out with API. I may end up making my own custom api specifically for each call I need. For instance, I’m calling the forum API on latest posts each time it iterates through, so that means 10 http calls. I think if I could build that into the response I could cut those queries by 90%! This use case is very useful for adapting the API. Keep us informed. Thanks @casiepa. As of yesterday I can now hit single topics and the replies show below. I would like to do a threaded formatting like the home page of UteHub.com but that would require recursion of the replies somehow, or using my custom walker or the bbpress reply walker to generate the API output. I will have many ideas as I go and communicate them. Currently both API’s I’m using pull in all the topic content and a bunch of other stuff which slows down the query. I only want to pull the topic content when I’m showing it in the topic view. For the forum name, author name/hash, and reply count I currently have to hit the api with 2nd, 3rd, and 4th http requests to the user endpoint, forum endpoint, and reply endpoint to get the data based on the id number. So that’s like 4x the api calls. It’s not snappy when I’m showing say the last 10 topics. Woohoo! The first version of my bbPress app for Android is now available! It’s read only, as there’s no API for posting or logging in yet. Hi @tkserver can you tell me how you build login/logout functionality in your app using api? I am also working on an app of a website which contains forums. I’m using JWT for authentication. Hey @zcodiaphotography I received an email notification about your inquiry but don’t see the post here. It might be caught in bbpress’s spam system. I have bbPress website and is it expensive to make android app of website? who can say the price? Hi @kabebi if you would like to discuss with me I’m happy to talk to you privately. I now have all new topics, replies posting to/from the API working on the bbPress mobile app! Close to doing a 2nd release. Great working together ! Keep us in the loop for newer versions. Thanks @casiepa! I’m just barely ahead of you now. I think if we can nail down the recent posts and some of the paging stuff I’ll release a full working version with login and posting in the next week or two. @tkserver Hi, I am also working on an app. Its working fine. I want to know how you implemented JWT auth because the plugin that I used from wordpress plugin directory is not seem to work for me. Can you plz share your experience. @tkserver I am also interested in the bbpress API or mobile app development. I couldn’t contact you via your website contact form. Can you please share your email? You can contact me via http://www.utehub.com/contact or via twitter @thegolfspace – not sure what “couldn’t contact you…” means. Is there an error or something? Hmm. I see that there was a recaptcha issue on the contact form. Turned it off for now pending fixing it. TESTED ON A REAL DEVICE AND WORKING! Since the last app update I’ve implemented a login which keeps you logged in basically forever unless you logout. Once logged in a user can post new topics, reply to topics or other replies, and vote with the thumbs up/down. @tkserver Hi bro, I am also working on login. Can you share a little bit how you managed to do this using jWT?